Need your party chassis lubed? Want to spark those plugs and dance, dance, dance 'til you run out of gas? There's only one place to go... Joe's Garage! 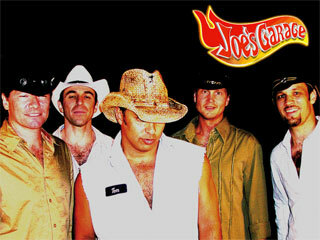 Vancouver's hottest live nightclub, "The Roxy," has been home to one of Vancouver's hottest dance bands... Joe's Garage! The boys in Joe's Garage have opened their bay doors to everyone and anyone who wants to enjoy a high energy, fun-filled night of excellent party Dance music! Noteable Entertainment & Events is a Vancouver based booking agency, party rental, entertainment services and event production company. If you are interested in booking Joe's Garage please contact us.